Lesson Objective: Making connections with the text. Evidence of Learning: Students make text-to-world or text-to-self connections. 1. Teacher introduces text. Discuss the front and back covers and record observations, things the students are wondering about. The teacher conducts a ‘book walk’: teacher talks about the pictures and engages students in a discussion predictingwhat the text might be about. Students make predictions. 2. Model read text to whole class. Identify the learning intention for the lesson. Model a text-to-world connection (local flood, news item, etc). Whole class. 3. Grand conversation: ‘make a connection with the text’. Teacher monitors students’ connections. Students share their connections with a partner using a think-pair-share and then share with the whole class. 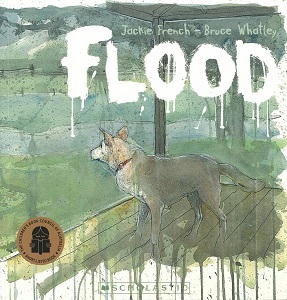 Lesson Objective: Explore the text in context of the 2011 Brisbane floods. Evidence of Learning: Use the senses to describe the people involved in the Brisbane flood. Refer to the information on floods on the imprint page of the book. 1. Teacher re-reads the text. List any unfamiliar vocabulary. If in an area away from water, words like torrent, jetty, surge, boardwalk may need clarifying. Whole class. 2. Teacher identifies how the author uses language to represent people in the text. Example: ‘heroes searched the water’, ‘strangers offered shelter’. 3. Brainstorm as a whole class sensing words (looks like, sounds like, feels like) to describe the people. Use evidence from the text. Example, ‘heroes searched the water’. Looks like (include visual symbols e.g. eyes): wet, people looking around. Sounds like (e.g. a picture of an ear): yelling, crying. Feels like (e.g. a picture of a heart or hand): cold, tired, brave. Students contribute to the brainstorm. 4. View the floods in Brisbane on YouTube. (Note the video is nearly 9 minutes long so watch it before the lesson and select an appropriate section or appropriate breaks to suit your group). Students work in pairs to brainstorm words they could add to the sensing chart reflecting on how the people were heroic. Some students may remember the actual event. Students write their words on cards to add to the chart. 5. Share words with the whole class. Compare or add to the whole class chart. Develop chart as a ‘word wall’ for future reference. Students add cards to the chart. Lesson Objective: Explore how floods have affected our community. Evidence of Learning: Use senses to explore the text in a local context. Resources: Relevant resources will need to be sourced depending on your location. Examples could include: pictures of local area, online reports, video clips, personal stories from community members etc. If your area is not flood prone select an area that might be of interest. It may be possible to organise to Skype a class in the area chosen and hear their experiences first hand. 1. Select and support students to explore local/appropriate resources. Could be whole class or group reading/viewing activities to explore resources. 2. Use senses chart to reflect on the local community experiences with floods or drought. Students use senses chart to record how people are represented in the findings from local area resources. 3. Depending on your location, this activity lends itself to a range of opportunities to explore the topic. Students share how people are represented in their community or an alternate chosen community. Students work in pairs to develop one collage of pictures to represent how people in their community are represented and/or one collage to represent how the characters are represented in the story. Students can draw or cut out magazines to show illustrations and pictures that represent the people. The students could cut out words to include on the collage as well. The pictures could include people themselves or images of objects that represent the descriptive words from the senses chart. For example, ‘people looking around’ could be represented by a picture of glasses or binoculars. The collages can be displayed in the library or community space for viewing by the public. Lesson Objective: Develop an understanding of how the author has used figurative language. Evidence of Learning: Paraphrase the meaning represented by the figurative language. 1. Re-read text to students. Whole class. 2. Teacher models paraphrasing. Example, ‘they offered hands and homes’ is the evidence from the text. I can put this into my own words by saying, the people didn’t really chop off their hands as this part of the text means the people offered to help by using their hands to clean up. Students observe teacher. 3. Discuss the figurative language in the text (previously identified by the teacher). Students work together to explain the meaning in their own words. Students could use a range of tools to represent their thinking e.g. visual or dramatic representations. Students work in groups. 4. Teacher monitors students’ responses. Groups share with whole class. Lesson Objective: Identify the heroes in the story and the heroes in the students’ lives. Evidence of Learning: Personally respond to the idea of a ‘hero’. 1. Re-read the text if required. Whole class. 2. Define the word hero. Discuss who are the heroes in the story and brainstorm on a mind map some characteristics. Students observe and listen. 3. Encourage students to identify a ‘real life’ hero. Students brainstorm in pairs who might be a hero in their own lives. 4. Introduce mind-mapping to the whole class before beginning. Choose a simple form to begin with. Monitor students’ mind mapping. Encourage students to share with their partner and/or the teacher and class. On individual whiteboards, students write the name of their hero and use the ‘mind map’ to brainstorm their characteristics. Alternatively use an online tool or app such as Popplet. Lesson Objective: Compare characters in the story with people from the students’ lives. Evidence of Learning: Students identify similarities and differences between the heroes in the story and heroes in their own lives. 1. Introduce a Venn diagram. Teacher models how to make comparisons between their person and heroes from the text. Note similarities and differences on an exemplar Venn diagram on chart paper or white board. Whole class. 2. Teacher guides students to use mind mapping from previous lesson. Students orally discusssimilarities and differences. 3. Teacher monitors students oral responses prior to completing the Venn diagram. Students complete Venn diagram (pairs, individual). Students create reading portfolio. The portfolio is a collection of evidence of students’ learning and thinking about reading. The portfolio will be able to be used as evidence for the curriculum identified throughout the learning episodes. Students could include a mind map of a hero. Venn diagram will show their ability to compare characters and events in texts to their own experiences etc. Lesson Objective: Listen to a range of Haiku poems. Evidence of Learning: Students listen to poems and identify a favourite. Resources: A variety of Haiku poems about floods. 1. Teacher model reads one poem at a time to students. See resources for suggestions. Students listen to teacher anddiscuss their favourites. Evidence of Learning: Students identify syllables in Haiku poem. Resources: Select the favourite poem from previous lessons. Information on haiku poetry. 1. Read a ‘favourite’ Haiku poem about floods. Total for poem is 17 syllables. Whole class. 2. Teacher defines syllables and models how to identify syllables by placing your hand under your chin. Each time your jaw drops, a new syllable is isolated. Model the first line. Observe teacher. 3. Support students to practise identifying syllables. Practise as whole class. Opportunity for guided reading/group work. Evidence of learning: Identify lexical words – focus on nature. Resources: Range of Haiku poems. 1. Teacher models to students a lexical word from the model Haiku poem. Examples, sun, shining, grey clouds. These are the words that carry meaning in the text. Whole class. 2. Direct students to engage in a word hunt for ‘nature’ words. Give students strips of card to record their words. Students work in pairs or groups to hunt for words from magazines, books, online material etc. Record words. 3. Discuss words and what they mean. Students add words to ‘nature’ word wall. Descriptor: Listen to, recite and perform poems, chants, rhymes and songs, imitating and inventing sound patterns including alliteration and rhyme. Elaboration: Listening to and performing simple haiku poems about familiar topics such as nature and the seasons. Resources: Range of Haiku poems about floods. Time: Students will need multiple opportunities to practise their performance of their poem. 1. Arrange students into groups based on their favourite poem. Students work in groups to practise a performance or recital of their poem. 2. Support and give feedback to students based on their class presentation. Students present poem to class. 3. Arrange a real audience for the students e.g. school assembly, open classroom visit etc. Students present poem to a ‘real audience’. Lesson Objective: Students recreate a scene from the text that is particularly meaningful for them. Evidence of Learning: Scene reflects text. Students are able to discuss their choice. Time: 60 mins (may need a second lesson). Resources: Text, paper, drawing and painting materials. Discuss the illustrations in the text. Read the blurb about Bruce Whatley’s artistic style. Revisit one page and discuss how the illustration enhances the text. Example: page with the text, ‘They offered hands and homes’. The illustration shows people helping each other to emphasise the meaning in the text. The artists choice to let the paint run in the illustration suggests it might still be raining or that there is a sense of ‘muckiness’. The lines aren’t clean and neither is the situation. Students select a key event in the story that they would like to illustrate. Discuss with a partner. Teacher to check ideas before students proceed to drawing and painting. Use pencils and water paints to represent the event. Students share illustrations (create a gallery to display the paintings). Evidence of Learning: Using descriptive words – adjectives to describe an illustration. Resources: Painting from previous lesson. Teacher uses own painting to model writing a descriptive sentence. Revisit adjectives and highlight in a model sentence. Use words developed from previous lessons such as the senses lesson. Example: My painting shows the caring and thoughtful people of Brisbane giving their dry homes to loved ones. In pairs, encourage students to use words developed from the previous lesson focusing on ‘senses’, to share a description of their painting. Use guided writing strategies to support students to develop their sentences with teacher support. Students write a sentence to describe their painting. Teacher provides feedback on use of descriptive language. Descriptor: Recreate texts imaginatively using drawing, writing, performance and digital forms of communication. Elaboration: Retelling key events in stories using oral language, arts, digital technologies and performance media. Students liaise with teacher to create a plan to exhibit their paintings and descriptions. Depending on your community, students may wish to share their work in different ways. Examples: sell at the school fete, create an art gallery and invite special guests or laminate paintings and create a mural for the local community hall. Students could also read Fire (French and Whatley) and compare/contrast the approach taken with Flood.